Rostec Corporation has built a test prototype of a small drone, the ‘Corsair’. By 2016, according to Rostec, the Russian Army will be using UAVs in active operations, and the main small drones will come from the Corsair’s manufacturer. State-owned United Instrument Manufacturing Corporation (UIMC) recently said it would acquire rights to co-ordinate the entire programme to develop unmanned aircraft in the country. Little is yet known about this pilotless aircraft, the ‘Corsair’. In December last year, Alexander Yakunin, general director of UIMC, said only that its main task would be monitoring surroundings within a 50-km radius. No new details were provided during the Army-2015 Exhibition. Citing secrecy laws in the defence industry, UIMC did not even display a photograph of this unit, or disclose its characteristics. But company representatives did not keep silent about their plans for next year, when they will start operational testing and delivery to the military of ready models, and begin mass production in 2017. In early 2014, the Ministry of Defence stated its intent to spend about 320 billion rubles on a programme to equip the armed forces with UAVs. Defence Minister Sergey Shoigu said exercises were held in which drones were used for the continuous monitoring of moving objects for over one hundred hours. According to Shoigu, not all military UAVs could make the mark. Given the fact that Russia has not managed serialised production of drones capable of long duration flights, it is clear he was speaking about small UAVs. At the beginning of 2014, the Russian army had more than 500 such units. This small amount was purchased from Israel – the drones IAI Searcher Mk II and IAI Bird Eye 400, as well as Russian vehicles from private companies, created using numerous foreign components. The latter constitute the majority of the currently used UAVs. 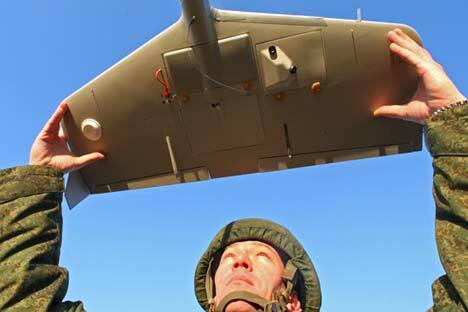 In all, five types of domestically produced Unmanned Aerial Vehicles were provided to the Armed Forces. These included UAVs from the Izhmash Unmanned Systems; Grusha (Pear) and Granat (Pomegranate), Orlan-10 from Special Technology Centre, and from Enix CJSC; the Aileron and Tachyon. It is unclear which UAVs failed to meet expectations of the Defence Ministry, but clearly, they all have some drawbacks. The UAV Grusha (Pear), which is used by airborne formations and units of the Main Intelligence Directorate (GRU) cannot operate at temperatures below -20 ºC. They also use many foreign-made components, such as laptop controllers made by Panasonic. Despite drawbacks, these programmes are continuing and there has been no information coming out about any glaring failures (like what occurred during the first programme in 2008-2010). The total flight time logged by UAVs in 2014 was four times higher than in the previous year. The fate of private manufacturers remains unclear. The state has decided to entrust coordination of building small UAVs in the hands of the UIMC, known for the creation of Soviet-era UAVs; Pchela (Bee) and aircraft Luch (Ray), Drozd (Blackbird), Tipchak, and Aist (Stork). The first never got off the ground, while the last crashed into the ground and burned up during testing in 2009, leaving evidence of the quality of work performed by their creators on Youtube. The UAVs Drozd and Tipchak, were part of the first “call-up” by the Ministry of Defence, after the agency spent five billion rubles on them and received nothing. Just as with the drones, very little is known about this programme. The press release issued by the UIMC stated only that it would be determining the level of funding as well as scientific and industrial cooperation in the development of critical advanced UAV technologies. Currently, the UAV program is going through the approval stage at the Russian Ministry of Industry and Trade.